I wanted to have a proper look at the process and practice of Roy Lichtenstein, but the pre-publicity for this year’s big Tate show meant my comments would be lost in the greater debate (I hoped), but apart from the Image Duplicator show Rian Hughes has organised at Orbital Comics there doesn’t seem to have been much consideration of the man’s work. The conversation has been steered towards his celebrity and the weak controversy of his alleged theft of other artist’s imagery. 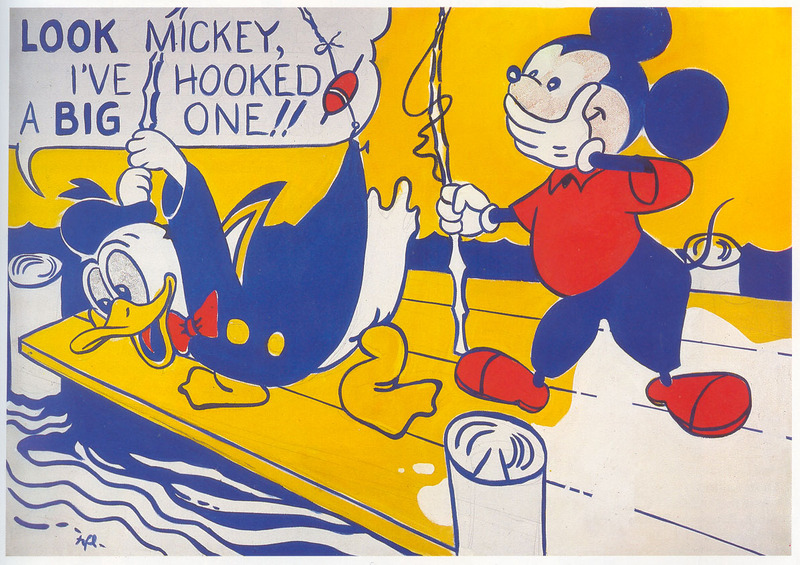 Lichtenstein’s comic-based canvasses were a clever idea, but after a series of paintings/one show, any serious artist would have moved on to new ideas or to build a dialogue with his source material and his audience. To continue in the same vein for so long should bring his credentials as an artist into question and suggest that he was more a producer of merchandise. The man himself did not plagiarise comic-books, although he did copy them clumsily without acknowledging the original artists ~ even when confronted with their identities. Any criticism from cartoonists of Lichtenstein gets dismissed as financial jealousy by the wider world, and if their claims were ever taken seriously they would quickly be derailed by the observation that the cartoonists he copied were working in a field where it was common practice to base drawings on previous cartoonists’ work or clippings from other media. This doesn’t make his activities ethical, but it does make the outraged reactions to him easier to dismiss. The critics who champion Lichtenstein (David Sylvester aside) tend to be lightweight arts writers with little significant writing behind them ~ Alistair Sooke for instance, who wrote the book of the current exhibition and presented the tv documentary preview is an art critic for the Daily Telegraph with a leaden approach that focuses more on the fame or notoriety of a work than any intrinsic merit. The art critics who talk about him at all either over reach (“I Can See the Whole Room … quotes abstract expressionism – the image suggests such seminal works as Kazimir Malevich’s 1915 Black Square – while entirely subverting its tone” said Sarah Churchwell in The Guardian!) or concentrate on his novelty value, which was surely played out the first time an art student mimicked his paintings to promote a student union gig. The commercial nature of the fine art world will naturally insist that any high-priced works are high art. There will never be anything permitted within that bubble that might argue seriously against the status (read: value) of the works. It’s noticeable how the original sources for Lichtenstein’s works are always referred to as ‘commercial artists’ without distinguishing how his work was every anything other than commercial. My own criticism of Lichtenstein is simply that he was not very good (as opposed to not being successful) at what he chose to do. He had one good idea, but the mediocrity of his craftsmanship undermined the work and the paucity of his imagination prevented him taking the idea anywhere beyond the surface. There are no convincing dialogues with previous, contemporary or future artworks in his paintings ~ just the same monologue repeated over and over again to diminishing effect. Lichtenstein, more than any other 20th Century artist, is frozen in his own perfect pregnant moment. Without the commercial value of his work, he would be a curious footnote in the story of art. 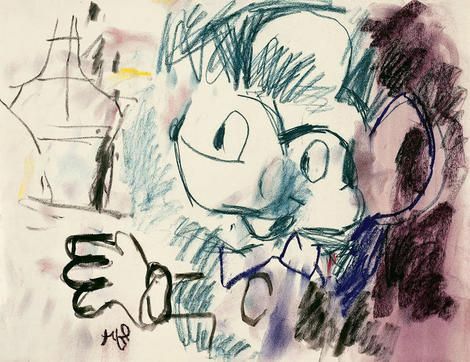 None of his work at the Tate has anything to say to later generations as it was long ago assimilated by the rest of the world ~ he is visual art’s equivalent of the miniskirt: shocking at the time but quaint within a decade. I had hoped that the scale of Lichtenstein’s work in the context of a serious retrospective would lend previously unseen weight to his imagery, but of all the paintings on show, only the Rouen Cathedral set (three pictures based on the work of Monet) are particularly effective. The viewer can lose oneself and the image in a blur of colour as one approaches these canvasses ~ this is true of the original Manets, of course, but exaggerated here to dramatic effect. These pictures would make for great public art or marketing in a passageway. The other fine art appropriations presented fail on almost every level. Often distinctly amateurish in execution and showing a level of aesthetic decision-making on a par with decorating tips one might glean from a home makeover show. As with the cartoons, there are no attributions in labelling the images based on paintings. It seems that for the critics and the gallery, Lichtenstein’s work uniquely exists in a vacuum – apart from the cultural and artistic legacies it trades on. Surprisingly, the comic paintings don’t gain any significant impact from scaling-up. I had expected them to have more ‘oomph’ after having seen them reproduced in books (etc, etc, etc). This was a noticeable distinction for me between Warhol’s work and the mass-market presentation of the same, but in Lichtenstein’s case bigger makes very little difference. His adjustments to compositions (seized on by critics as evidence of his artistic genius) are usually a case of not pushing far enough to develop whatever ideas he had of a “removed, technical almost engineering drawing style”. And they hew too closely to their sources to effectively comment on any wider issues than an artist’s predictable interest in the ‘pregnant moment’. On the whole, Lichtenstein’s changes to his appropriated artworks are considered but clumsy to the point of often seemingly arbitrary. Lacking subtlety, they demand serious attention to the compositions’ potential connections/abstractions/contradictions, but the artist has been satisfied to crudely mix and shuffle elements of pre-existing works without adding anything new. The best that may best said for these pictures is that they are bright and decorative and the act of showing/selling them was provocative in the 60s. They are a historical curiosity that will satisfy the craft shopper but have little to offer a student of the form. In a rare break from his habit, Lichtenstein’s 1988 painting Laocoon features actual brushmarks. 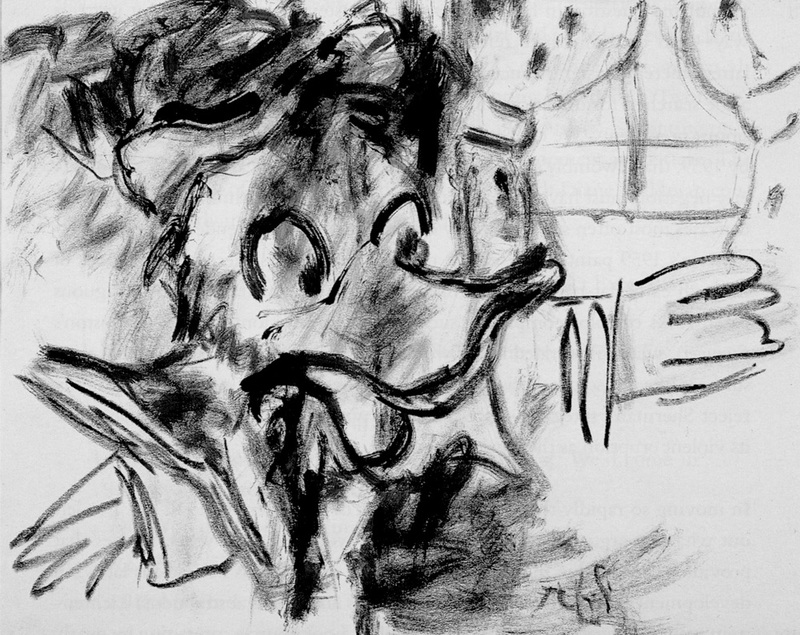 Like the Rouen images, this teasingly hints that the artist could have taken his idea forward into new and challenging territories, but he seems to have fallen back into the same tired commercial schtick soon after. Lichtenstein’s sculptures and Chinese landscapes (lauded by many visitors and commentators purely for not being something they were previously aware of) are definitely preferable as decoration to similar works for sale in my local garden centre. The mirrors, self-portrait and Interiors ‘studio’ of the 70s actually do something with the Lichtenstein style ~ showing a world from a specific perspective ~ and I have to say they do it rather well. While the bulk of his work tends to elicit a jaded, nostalgic smile, the late nudes series is fun and potentially raises actual questions in the viewer (for me, accidentally sending criticisms through time of the sexualisation of children’s comics prevalent today). If Lichtenstein had shown any real awareness of the comics industry, they might be considered a call back to the tales of cartoonist Jim Mooney drawing all his figures naked and adding costumes only at the inking stage of his process… but obviously they are not even as deep as that in-joke would be. They are merely another spin on an old idea. 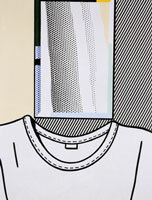 Which sums up Lichtenstein’s oeuvre quite neatly.